1/4 cup fresh parsley or two tablespoons dried parsley. Make sure it’s a fresh if you’re using the dried version! 4 cups (or more) cooked whole wheat farfalla, penne, and shell pastas- all about the same size, so they’ll cook evenly. Cook the pasta on your range just like you would cook any other pasta to almost Al Dente. You want to remove it and make sure it does not stick by adding a tiny bit of extra virgin olive oil or canola oil to the pasta. You can slightly under cook the pasta because it‘s going to be in the slow cooker blending the sauces for a couple hours on low. 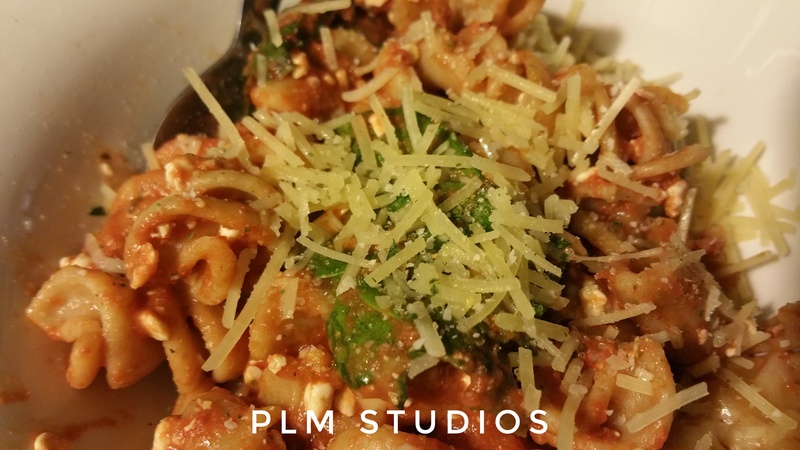 I blended the sauce in the stainless steel reservoir of the multi cooker, but you can simply make the sauce portion in your Crock-Pot and then add the pasta right to the pot with the sauce in it. Makes it easier so you can just simply make the sauce separate from the pasta. Once the pasta is cooked I added it to the multi cooker with the sauce and gently blend with a wooden spoon, carefully making sure you don’t tear the noodles. 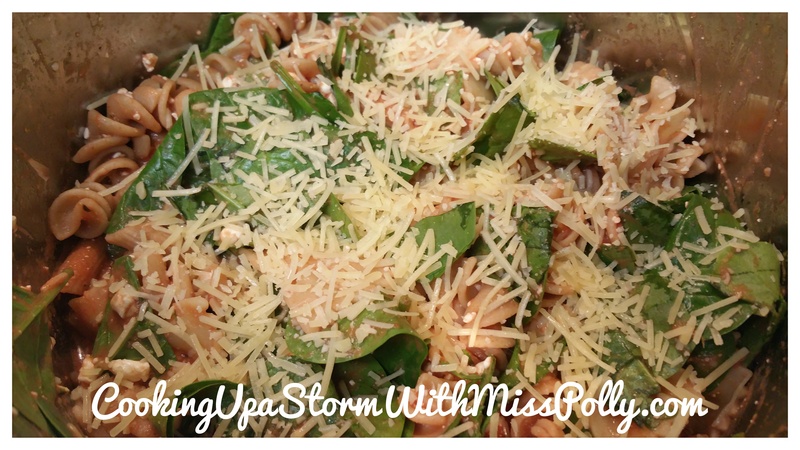 Top with the fresh baby spinach which will steam in the slow cooker gently and gradually. The original recipe asked that you cook it on low for 4 hours to 5 hours but I found that after 3 hours that was enough. You be the judge here. Basically when the pasta AND SAUCE is hot CHEESES ARE MELTED AND VEGGIES COOKED and NOT MUSHY IT IS DONE. Basically what you’re doing is you’re just wanting to turn all the cheeses into like molten lava inside the crock pot and you want to steam any the vegetables lightly that are in there. The original recipe, which I modified greatly, came from one of Phyllis Pellman Good’s outstanding books in her collection called Fix it and Forget it Lightly. The original recipe was called Cottage Cheese Casserole from Melani Guengerich Novinger in Austin, Texas. Below is the original recipe and she layered the cooked pasta with the Parmesan and cheesee and there was no tomato puree or pesto or Italian seasoning or garlic as I added. The original 1/2 cup each fresh mushrooms, onions, and celery for the aromatics. 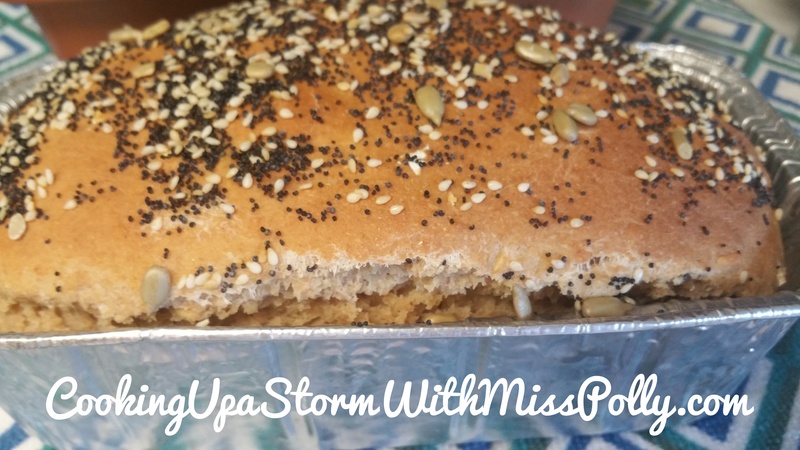 Either way, I think you’ll enjoy this very much and once you make this you will have enough for several dinners if you have a very small family. I was able to put a meatloaf size Anchor Hocking glass container full of this in my freezer. I also had two quart-size mason jars and a small one that I could just have for lunches for the week. I like finding things that I can make when I’m really busy that are healthy and good and this is high in protein because of the cottage cheese and the whole wheat pasta that I used. You increase the protein and fiber in the pasta a lot when you choose whole wheat pasta versus the regular. Feel free to vary this recipe and add whatever kind of vegetables you want to it. If you make the dish, make sure and tell me about it I would love to hear from you! Until next time have a blessed evening and see what you can cook up in that kitchen ears that you never try. Try something new and spice up your life and everybody else is with it. Written by Paulette Motzko. Photography by Paulette Motzko. December 16th 2017. 10 p.m. Happy Holidays to you all, however you celebrate.